The Government of India launched the National Rural Health Mission (NRHM) mainly to strengthen health services in the rural areas. It seeks to provide effective health care to the rural population by improving access, enabling community ownership, strengthening public health systems, enhancing accountability and promoting decentralization (Ministry of Health & Family Welfare 2005). Under the NRHM, there is a specific scheme, the Janani Suraksha Yojana (JSY), which was introduced in April 2005. The main objective of JSY scheme is reducing Maternal Mortality Rate (MMR) and Infant Mortality Rate (IMR) by encouraging institutional deliveries, particularly in Below Poverty Line families. The paper intends to study the impact of Janani Suraksha Yojana on institutional delivery and Infant Mortality rate. The results show that before implementation of JSY the rate of institutional delivery was less and IMR was high. But after the implementation of JSY the number of institutional deliveries has increased and infant mortality rate has reduced significantly. Finally, it can be concluded that NRHM launched by Government of India holds great hopes and promises to serve the deprived undeserved communities of rural areas. If Government improves the awareness on Janani Suraksha Yojana then there is no doubt that Karnataka can increase its institutional delivery and reduce infant mortality rate. Keywords: Institutional Delivery, Infant Mortality Rate, Janani Suraksha Yojana and Karnataka. Every pregnant woman hopes for a healthy baby and an uncomplicated pregnancy. However, every day about 1500 women and adolescent girls die from problem related to pregnancy and childbirth. Every year, some 10 million women and adolescent girls experience complications during pregnancy, many of which leave them their children with infections and several disabilities (G.R Jayashree). Pregnant women die in India due to a combination of important factors like, poverty, ineffective or unaffordable health services, lack of political, managerial and administrative will. All this culminates in a high proportion of home deliveries by unskilled relatives and delays in seeking care and this in turn adds to the maternal mortality ratios. The institutional delivery plays major role in reducing MMR and IMR. In India, while 77 percent of pregnant women receive some form of antenatal check-up, only 41 percent deliver in an institution. Even though all services are free only 13 percent of the lowest income quintile delivers in a hospital. As per sample registration system 2005, IMR in India was 58 and institutional delivery was 38.7 whereas in Karnataka IMR was 50 per 1000 live births and institutional delivery was 60 (SRS 2001-2003 and NRHM Implementation Plan 2011-12). In developing countries like India, the health care services are not equally distributed. The organizational structure requires a concern particularly with the maternal health. The Government of India has been implementing various programmes from time to time to tackle these issues. It launched the Reproductive and Child Health (RCH) programme in 1997, which aimed at universalising immunization, ante-natal care and skilled attendance during delivery. Reduction of maternal mortality was an important goal of RCH-II that was launched in 2005. One of the main interventions was to provide emergency obstetric care at the first referral unit. Incentives were also given to staff to encourage round the clock obstetric services at health facilities (Ministry of Health & Family Welfare 2008). Later in 2005, the Government of India launched the National Rural Health Mission (NRHM) mainly to strengthen health services in the rural areas. It seeks to provide effective health care to the rural population by improving access, enabling community ownership, strengthening public health systems, enhancing accountability and promoting decentralization (Ministry of Health & Family Welfare, 2005). Under the NRHM, there is a specific scheme – the Janani Suraksha Yojana (JSY), which was introduced in April 2005. The main objectives of JSY scheme were reducing Maternal Mortality Rate (MMR) and Infant Mortality Rate (IMR) by encouraging institutional deliveries, particularly in Below Poverty Line families. Under this scheme cash incentives are given to women who opt for institutional deliveries and also to the local health functionary ASHA (Accredited Social Health Activists) who motivates the family for institutional delivery and helps them in obtaining ante-natal and post-natal services. As of today, the Janani Suraksha Yojana (JSY) is a largest conditional cash transfer programme in the world, with the number of beneficiaries increasing from a mere 7 lakh in 2005-06 to almost 92 lakh in 2009-10. “A Rapid Appraisal on Functioning of Janani Suraksha Yojana in South Orissa” undertaken by Nandan (2008) reviewed the operational mechanism and usage status of JSY Scheme, reasons for non usage, perception and awareness of beneficiary and non beneficiary mothers and the involvement of ASHAs, ANMs along with district and block officers in the implementation of JSY. The study on “Advantages as Perceived by the Beneficiaries of Janani Suraksha Yojana (JSY) in Bikaner District” by Kumari(2009) revealed that some essential advantages perceived by the beneficiaries of JSY were safe delivery at PHCs and CHCs, helpful in population control, payment of Rs. 1400 to the mother (in rural areas) after delivery, full protection after delivery etc. Whereas, last but not least advantages expressed by the beneficiaries were testing of salt sample for protection from Gulgund, availability of water, bed and electricity etc. at PHCs. The study on” Impact of Janani Suraksha Yojana on Selected Family Health Behaviors in Rural Uttarpradesh” by Khan et.al (2010) informs that Janani SurakshaYojana is a monetary incentives and non-incentivized services and counseling by the ASHA have increased Client-provider contact, the percentage of women receiving three ANC check-ups. This study briefly explores extent to which the JSY has succeeded in achieving its goal or promoting positive family health behaviors that have a significant bearing on maternal and neonatal mortality. Ambrish (2010) in his study “Effect of Mortality Incentives on Institutional Deliveries: Evidence the Janani Suraksha Yojana in India” observed that the scheme has been in operation only for 5 years and the sample covers only the first three of these years. Hence, the paper captures only the short-run impact of the scheme. The short-term result indicates the JSY is indeed making a difference. Even though the JSY seems to have a positive impact on the institutional deliveries, its impact on maternal and neo-natal mortality is minimum. Mutharayappa (2010) revealed that institutional deliveries have increased, along with knowledge of family planning methods and utilization of government health services. These are encouraging sign. Promoting of institutional deliveries need to be sustained in order to reduce pre natal and neo- natal mortality rates. The study on” Missed Opportunities of Janani Suraksha Yojana Benefits among the Beneficiaries in Slum Areas” by Wadgave et.al (2011) mainly focused on main reasons of missed opportunities of JSY benefits among the beneficiaries. Out of 3212 women 360 (11.20) were eligible for getting the benefits of Janani Suraksha Yojana. Among the 360 only 118 (32.78) women got the benefit of JSY while, 242 (62.22) missed the opportunity of getting JSY benefits due to lack of JSY information, difficulty in getting the documents fulfilled and not filling the form at proper time were three common reasons in not getting the benefit of JSY. The percentage of beneficiaries was more in receiving ANC care delivery done in Government hospitals. Dilip et.al (2012) in their study “Low Coverage of Janani Suraksha Yojana among Mothers in 24-Parganas (South) of West Bengal in 2009” reported that inadequacy of fund and delayed payments of financial benefits lead to low coverage of JSY. Institutional delivery has increased with decreasing in Infant Mortality Rate after implementation of JSY. To Study the impact of JSY on institutional delivery rate in Karnataka. To Study the impact of JSY on infant mortality rate in Karnataka. Janani Suraksha Yojana has significantly increased the number of institutional deliveries and reduced the infant mortality rate in Karnataka. There is significant relationship between Institutional deliveries and IMR rate in Karnataka. Keeping the objectives in the mind, the present study employs various statistical and econometrics tools like table, graph, Paired t test and Correlation co-efficient. The secondary data is collected from Ministry of Health and Family Welfare Statistical Report, RCH Second Implementation Plan, NRHM Operational Guideline, NRHM Annual Reports, Karnataka State Report on NRHM 2005, Karnataka Human Development Reports 2005, SRS Bulletin, WHO Reports, Five Year Plan Documents, Word Bank Reports and Census Reports. 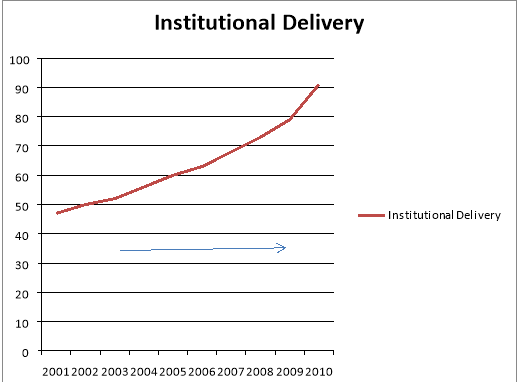 From the table and chart [Table.1 Chart 1], it is clear that Institutional Delivery Rate in Karnataka from 2001 to 2010. Before implementation of JSY, institutional delivery rate was 60 percent in 2005 but after implementation of JSY which increased 63 percent to 91.3 percent in 2006 to 2010. On the basis of analysis conducted by using paired sample T test, there is a significant difference in the number of institutional deliveries. Further, it pointed out that after implementation of JSY scheme a significant increase was observed in institutional delivery rate in Karnataka. From the table and chart [Table.3 chart.2], it is clear that Infant Mortality Rate in Karnataka from 2001 to 2012. The infant mortality rate of Karnataka was 58 per 1000 live birth as per the censuses in 2001, out of which 69 percent were rural areas and 27 percent were urban areas. Keeping pace with the national average, Karnataka recorded a sharp decline in the infant mortality rate from 50 percent in 2005 to 32 percent in 2012. It means before implementation of JSY infant mortality rate was high and after implementation of JSY infant mortality rate has declined significantly. On the basis of analysis conducted by using paired sample T test, it indicates that the IMR rate was 52.80 before implementation of JSY and it has decreased to 43.80 percent after implementation of JSY. 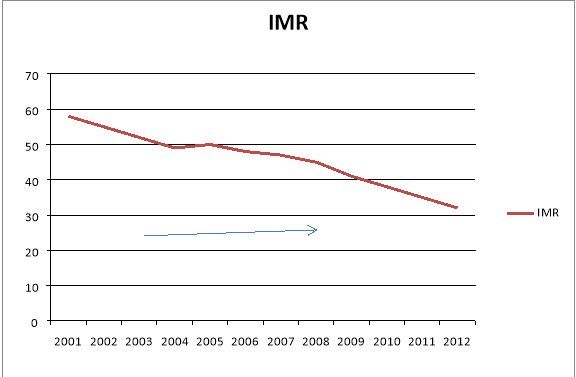 Overall, the decreased rate of IMR was 9.00. The t statistic is significant at 1% (df: 5, t: 10.06, sig.0.001) level. Hence the null-hypothesis of no difference is rejected and alternative hypothesis of significant difference is accepted. Significant negative correlation has observed between Institutional Deliveries and Infant Mortality Rate. Where the correlation of -.971 was found to be significant at .001 level. In other words with an increase in the Institutional Delivery the IMR rates have been reduced. Before implementation of Janani Suraksha Yojana institutional delivery rate was less and IMR rate was high. After implementation of Janani Suraksha Yojana has helped to increase the rate of institutional delivery and reduce the rate of infant mortality significantly. Significant negative correlation has observed between Institutional Deliveries and Infant Mortality Rate. In other words with an increase in the Institutional Delivery and the IMR rates have been reduced. The result of the formative study clearly indicates that Janani Suraksha Yojana has increased the institutional deliveries in India and Karnataka. It found that institutional deliveries have increased and IMR has been reduced after implementation of JSY. Does, it can be conclude that if the implementation process is strengthened, quality improved and programme is effectively monitored, the institutional deliveries will increases in future their by helps in reducing the IMR rate. Further it will helps to full fill the commitment made towards IMR under Millen Development Goals. Ambrish Dongre, (2010 “Effect of Mortality Incentives on Institutional Deliveries: Evidence the Janani Suraksha Yojana in India”, SSRN Publication, 1-27, New Delhi. Basic Indicators: Health Situation in South East Asia. World Health Organization, South East Asia region, Community journal 2004; 56-2-3. Dilip K Mandal,Prabhdeep Kaur, and Manoj u Murhekar, (2012) “Low Coverage of Janani Suraksha Yojana among Mothers in 24-Parganas (South) of West Bengal in 2009”, Biomed Central the Open Access Publisher. Khan.M.E. Ashok kumar. Health Status of Women in India; Evidence from National Health Survey.2010 August; vol 6:1-21. Khan M.E, Avishek Hazra, and Isha bhatnagar, (2010)” Impact of Janani Suraksha Yojana on Selected Family Health Behaviors in Rural Uttarpradesh”, Journal of Family Welfare, Vol. 56, New Delhi, 9-21. Kumari Vinod, Dhawan Deepali Singh, Archana Raj, (2009) “Advantages as Perceived by the Beneficiaries of Janani Suraksha Yojana (JSY) in Bikaner District”, Journal of Dairying food and Home Scinces,Vol,28 issues 3and 4. Mutharayappa, R., 2010, Functioning of Janani Suraksha Yojana in Hassan District Karnataka. The Indian Journal of Social Work, 71(2):167-180. Nandan Devadasan, Maya Annie Elias, Denny Jhon Shishir Grahacharya and Lalnuntlangi Ralte, (2008), “A Conditional Cash Assistant Programme for Promoting Institutional deliveries among the Poor in India: Process Evaluation Results,” International Journal of Commerce, Economics and Management, Vol. No.2. Nandan (2008),“A Rapid Appraisal on Functioning of Janani Suraksha Yojana in South Orissa,” Indian journal of Community Medicine, Oct-Dec 35(4), 453-454. Operational Guidelines for Implementation of Janani Suraksha Yojana. Parul Sharma, Jayanti Seemwal, Surekha Kishore, (2011) “A Comparative Study of Utilization of Janani Suraksha Yojana in Rural Areas and Urban Slums”, Indian journal of community Health, Vol.22, No.2, vol.23, No1. Wadgave Hanmath Vishwanath, Gajanan M JettiUpendra, Tannu (2011) “Missed Opportunities of Janani Suraksha Yojana Benefit among the Beneficiaries in Slum Areas”, National journal of Community Medicine, Vol, 2 and Issues1. "Impact of Janani Suraksha Yojana." UKEssays.com. 11 2018. All Answers Ltd. 04 2019 <https://www.ukessays.com/essays/economics/impact-janani-suraksha-yojana-2321.php?vref=1>. "Impact of Janani Suraksha Yojana." All Answers Ltd. ukessays.com, November 2018. Web. 19 April 2019. <https://www.ukessays.com/essays/economics/impact-janani-suraksha-yojana-2321.php?vref=1>. UKEssays. November 2018. Impact of Janani Suraksha Yojana. [online]. Available from: https://www.ukessays.com/essays/economics/impact-janani-suraksha-yojana-2321.php?vref=1 [Accessed 19 April 2019]. UKEssays. Impact of Janani Suraksha Yojana [Internet]. November 2018. [Accessed 19 April 2019]; Available from: https://www.ukessays.com/essays/economics/impact-janani-suraksha-yojana-2321.php?vref=1.